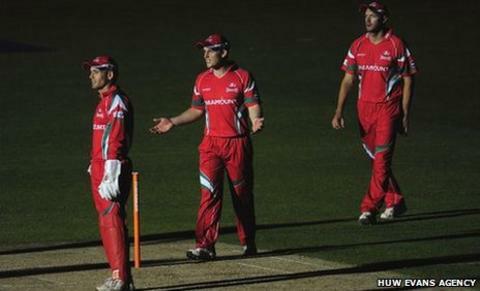 Glamorgan beat Middlesex in a game which descended into farce after floodlight failure. Alviro Petersen's impressive 72 helped Glamorgan to a formidable 199-4 from their 20 overs. Middlesex were already doomed to defeat before three floodlights went out causing a delay in play for more than 20 minutes. When the game resumed they were set a resumed target of 183 from 18 overs but were bowled out for 137. Chris Rogers (28) and Scott Newman (23) gave Middlesex some early hope but they gradually fell well behind the pace. When three floodlights failed it appeared the game may have to be abandoned. Power was eventually restored but the return to action merely continued Middlesex's misery. Alex Jones's 3-16 from three overs capped a series of good bowling displays from the home side. "After the floodlights went out and two overs were lost, it didn't deter from an excellent all-round performance from Glamorgan. "Their 199-4 was down to some outstanding performances from Alviro Petersen, who made 72 from 48 balls, and there was 22 from debutant Chris Cooke from just six balls. "Then the bowlers played their part, together with some outstanding fielding." "It was a strong performance from Glamorgan that didn't give Middlesex much of a chance to get going. "Middlesex may feel that they bowled without luck in the opening overs as a few nicks and nudges continued to find the boundary without any great effort. "From their solid start, with plenty of wickets in hand, Glamorgan maintained their run rate throughout and was more than topped up by Chris Cooke hitting Ryan McLaren for three successive sixes followed by a four. "Although matching the run rate to start with, Middlesex lost wickets throughout and failed to form a partnership of note."